Simple Supper: Mediterranean Lamb Meatballs with Goat Cheese & Cucumbers! / Hey, EEP! 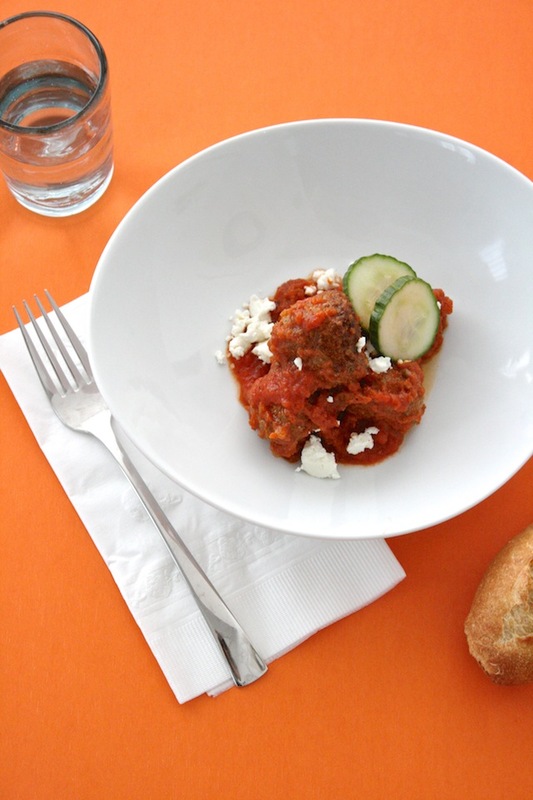 Simple Supper: Mediterranean Lamb Meatballs with Goat Cheese & Cucumbers! 4 ounce fresh goat cheese, crumbled. 1. Toss the cucumber, vinegar and a generous pinch of salt in a bowl. Cover and refrigerate until ready to use. 2. Gently mix the lamb, shallot, 2 teaspoons cumin, 1/2 teaspoon salt and 1/4 teaspoon pepper in a large bowl until combined; roll into 1-inch meatballs. 3. Heat the olive oil in a large skillet over medium-high heat. Add the meatballs and cook, turning occasionally, until browned on all sides, 6 to 8 minutes. 4. Add the marinara sauce and remaining 1 teaspoon cumin to the skillet and cook, stirring occasionally, until simmering. 5. Drain the cucumbers. Divide the meatballs and sauce among bowls. Top with goat cheese and cucumbers. Serve with baguette for dipping.